DVC94 is 3/10 in the Nightburnerz series and part of the 2017 Super Treasure Hunt set. The sports car is black with diagonal red stripes on the sides and top. “74” in a white square, “Advan”, and “Kaido House” are on the hood. A variety of white logos decorate the sides and “TH” and the Hot Wheels logo are on the trunk. The car has tinted windows, a gray interior, gray 8-spoke Real Rider wheels with orange rims, and a red plastic Malaysia base. 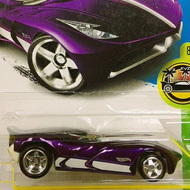 This vehicle can be found in mix “Q” of 2017 Hot Wheels mainline cases. The car made its debut in the 2016 HW Speed Graphics series. 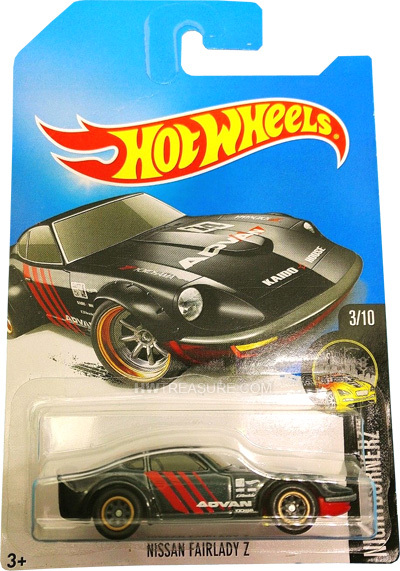 It is based upon the actual vehicle that was sold in Japan and exported as the Datsun 240Z.